This Campaign starts from Country of Hinnegard - Prologue and continues from Country of Hinnegard - Xanowa's Track, wich is a sequel to Country of Hinnegard - Marching To The Freedom. In my opinion, this is the most well done part, and the foremost scenario from the campaign. An improved grammar (revised many times), great sound effects/musics, much trigger work, many sidequests, a intense and hard gameplay and much more atmosphere than the other ones. South Western Xanowa was being stormed by the Halybling's army remainder. They've brought the top technology weapons from the time; heavy cannons and chermical catapults, wich was the main project from Charles Blingen. After marching through the harsh desert, the heroes could finally arrive there to fight. All would be decided when the last man standing. An intense and hard gameplay. More than 2 hours. A misture of game styles; including boss-battles, roleplay, defend the spot, fixed army and much more! 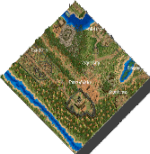 Detailed scenario, with ruins, fortress, swamps, forests, camps and much more! Dinamical difficulties wich changes the gameplay dramatically. Great sound effects and musics (total of 38). Well writen hints, explaining all about you are supposed to do. More than 12 long, hard and creative missions! A good amount of eye-candy! A much better quality than the last part (Xanowa's Track). Comments and reviews are always welcome! Please, if you find any bug or minor grammar mistake, tell me. Very great campaign. The story is very attractive . And when will the last part be released? Can't wait to see it!! But I guess I won't complete this campaign (as I guess the story isn't that attractive :/). What a shame. I've seen many unfinished campaign and yours is one of them (and I really want to see what happens afterwards when so many main characters die and there's only one that survive). Anyway thanks for sharing with us such a so good campaign. "The Last Struggle" is the final scenario in the unfinished campaign "Country of Hinnegard"
I quite enjoyed the gameplay for the most part, with the scenario delivering a tightly focused event driven gameplay. The player encounters many different situations such as sneaking through a fortress, defending a fortress, hunting down fleeing troops, and also taking over an enemy fort. Most of these were fun, with a few frustrating parts that could be partially blamed on the AoC engine, particularly its pathfinding and formations. The experience was reminiscent of the grand old campaigns from the good old days;an epic storyline, interesting characters, and hard fought battles with a great overall atmosphere. The enjoyment of the story was often marred by the poor english, unfortunately. I played through on Hard, and found the difficulty to be appropriate. All the battles tended to be well balanced with the player having just enough forces to handle the threat, with defeat a real possibility. The battles were fairly intense although there was often ways to exploit the terrain or move your units in unexpected ways to utterly crush the enemy. A possible problem is that units were often reused in future battles, so low efficiency in early battles may well make future situations absurdly tough. The challenges issued by the scenario were decent, with a few aggravating scenes. One thing I found a bit irksome in combat scenes was being given cavalry and then the enemy had halbadiers, and then receiving infantry units but now the enemy has onagers. I would prefer being given a mix of units that could be used appropriately to handle each situation in turn rather than these lopsided encounters. Also at one point the player had to defend two gates, and was told to defend each equally. However the enemy attacked one much harder than the other, and with much different troop types so you would be much better off there with an uneven allocation of troops. But when the enemy is already in your face, its too late for strategy then. Another problem is the horde of weak, useless heroes the player is often tasked with keeping alive. Some of them are more frail than your elite cavalry units, which means you just stick them in the back somewhere and avoid them. When using heroes, its important to make them more powerful, otherwise whats the point in calling them heroes if they are deadweight? The one on one battle with the king against the enemy leader was handled very poorly. The player with virtually no instructions is supposed to know you can grab an axe from a blacksmith, throw it to cause a fatal injury, then hide out in the open (ostensibly in a crater thing Ulio-style) by clicking a pavilion. From whence you can clearly see your unit standing there. You click on the same pavilion to stop hiding, so you will die repeatedly due to popping back out as soon as you hide, and there is no reason to ever stop hiding on purpose anyway. I had to reload this dozens of times with incremental savegames to make it through. I found the scenario to be quite creative, perhaps being too ambitious for its own good as the game is rather unpolished with seemingly cut content. The scenario had a tightly woven scripted gameplay leading from one scene to another, with a great variety in gameplay styles. There was stealth sections, DTS, and unusual gameplay such as running down fleeing soldiers. Not that every situation was particularly amazing but the attempt at variety was quite good. A variety of side quests were available, but I actually couldn't figure out how to interact with them. Good usage of sound effects lent a nice atmosphere to the scenario. Music was present, but less so than in previous missions and a longer soundtrack based on the music already used would have been a solid addition. The mapping effort was good for the most part, with a few odd looking areas. The basic mapping in common areas such as forests was nice with the broken up woods look, and the terrain mixing underneath these trees lent a nice atmosphere. The roads were pretty good with a heavily worn out appearance. The various fortresses were well done with broken down walls though a little more detailing to cover the spots where walls cross elevations might be nice. The main fortress was actually a bit too empty and could use some more buildings in it. The worst part of the map is featured heavily, the massive custom mountain between the two main fortresses using gaia mountains and rocks looked terrible. It was also harder to navigate around with its oddly cramped road system. The layout of the map is often a detriment to gameplay, with the player given artificial barriers to movement that make no sense, most notably around that mountain where the player often receives messages about not going into the forest. This is all especially puzzling when looking at a full map print out, as natural geographic barriers exist that could perform the same function in an organic way. There is a ton of finished mapping here that the player is encouraged to avoid viewing;its actually more impressive when viewed on the print out, as the players limited LOS prevent him from understanding how the locations fit together. Perhaps some more vision revealers like trebuchets or outposts temporarily created and then removed when entering areas would have helped. I often got the feeling from things like this and the poor instructions that the author hadn't considered seriously what things would look like from the players perspective, which is easy to forget about when working in the marco polo map editor. An epic storyline is certainly the main strength of this scenario, yet a combination of factors brought down the score considerably. Chief among these would be the grammar, which resembles something Google Translate spit out with a bit of corrections added. It often corrupts the meaning of sentences slightly, though they still manage to be understandable. Considering that the scenario relies heavily on a narrative driven plotline, this is both noticeable and inescapable. The other problem here lies with the instructions. Toward the latter half of the scenario, these degrade in quality considerably with the player often confused about what exactly to do in order to proceed correctly. Its all to often possible to get out of the gameplay box within with the author intends the player to stay within, breaking the immersion. Moving units ahead of time to catch the elite guard, for example. The scene with the King fighting the enemy leader was terrible, with the player expected to figure it all out on his own. I could easily see this campaign receiving a 5+ rating here if only the above two issues were resolved satisfactorily. Its an interesting storyline marred by technical issues, and I quite enjoyed the way events were portrayed. There was a dark atmosphere to it, and I appreciated the note the scenario concluded upon. The characters were good, but there are far too many of them. Final thoughts:Making a recommendation about choosing to play this scenario is tough. It surely belongs to its campaign rather than being played as a standalone scenario, though the previous scenarios are both lengthy and unfinished at times. Were it to be released in a polished and finished campaign formation, I have no doubt that it would make some waves but as is its a bit of a choppy ride. Hey! Thanks a lot for the review, Cataphract887! Yeah, yeah, my english was pretty crappy back then... Even thought it still is far from being perfect now, I'm willing to give this scenario a little rework after the completion of the my last instalment of the Cavern Pirates series, since, like you've said it yourself - this could have been easily a much, much better experience. Indeed I've balanced the difficulty of this whole campaign around the designer's perspective, rather than around the player's. This series definitely won't receive the last scenario (a cinematic, potraying the fate of plagued Hinnegard), due to the lack of experience I've had on storytelling - and on writting proper sentences in english - at the time I made the first 2 instalments... It's just no worth fixing this crap ton of dialogues and scenes. PS: Could you explain me why you couldn't acess the sidequests? Was it some kind of bug?